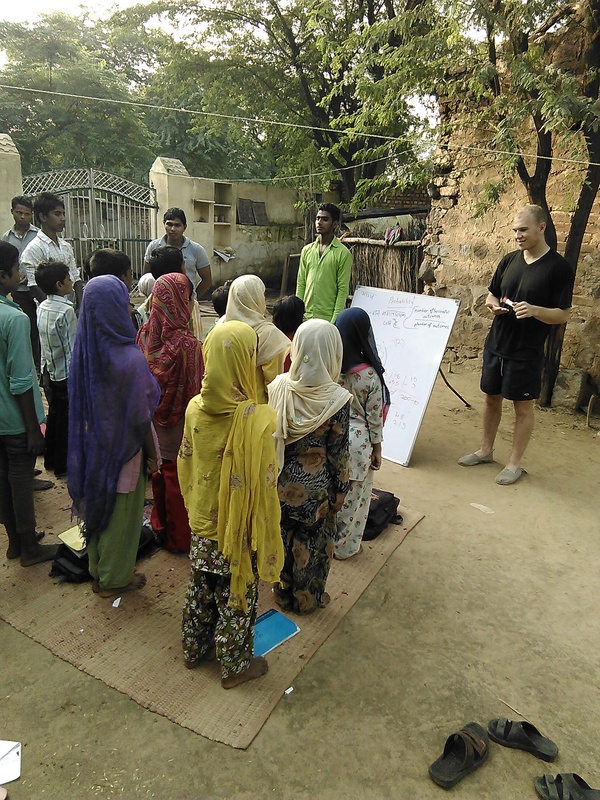 The Warwick Volunteers divided the teacher training classes in to four parts. The first part is to start the class with an educational game, secondly they plan activities by using the resources from the library and present their ideas in front of the class. For the third part they introduce an activity to make the teaching effective and the fourth part is lesson planning. On Monday morning class began with the parachute game. So, eight teachers held the parachute and were assigned numbers such as: 1, 2, 3, 4. Then the volunteers asked the teachers to change places according to the multiple of two numbers, such as: two times three is six and then two and three will change places. 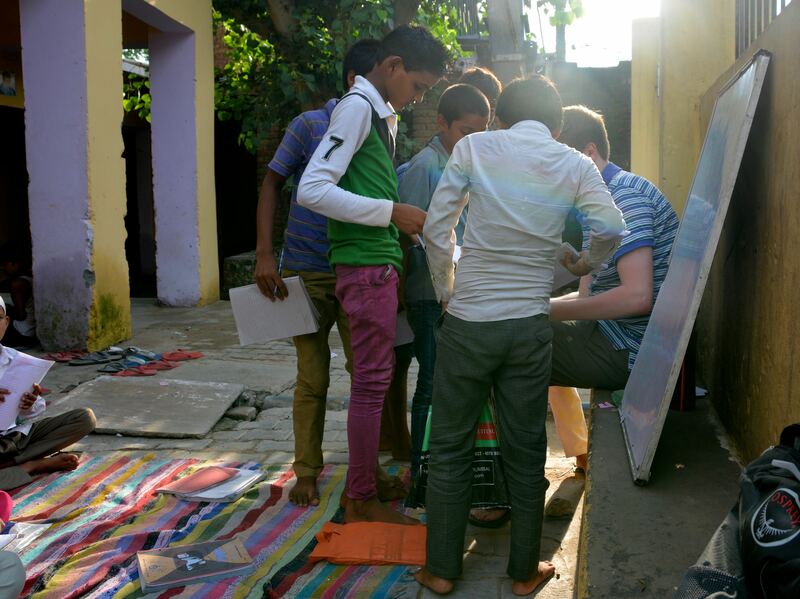 The Warwick volunteers introduced many educational games for English and Maths by using the parachute and made teaching interesting. As I mentioned above, we asked the teachers to plan an activity using the puppets, (Mr. monkey and Mrs. elephant) for example. 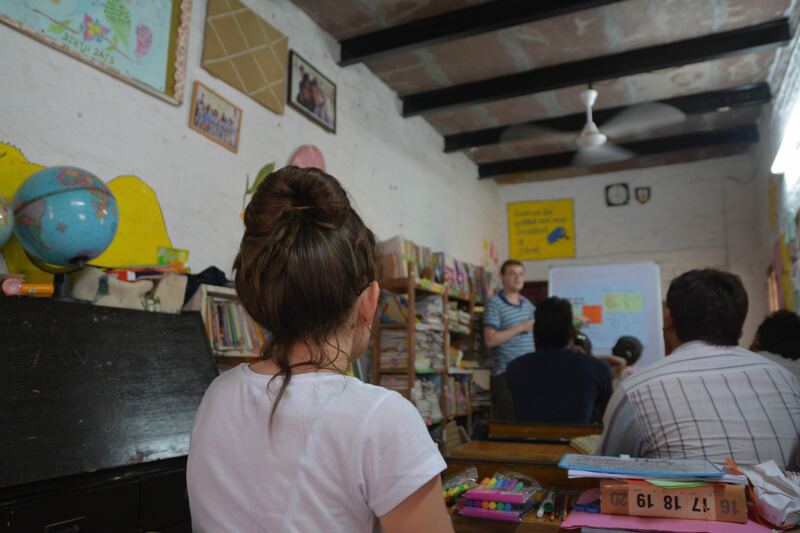 Once they had individually planned an activity, they explain them to the class, which was an interesting way to teach them how to use the resources in their lesson plans and give them more presentation practise. 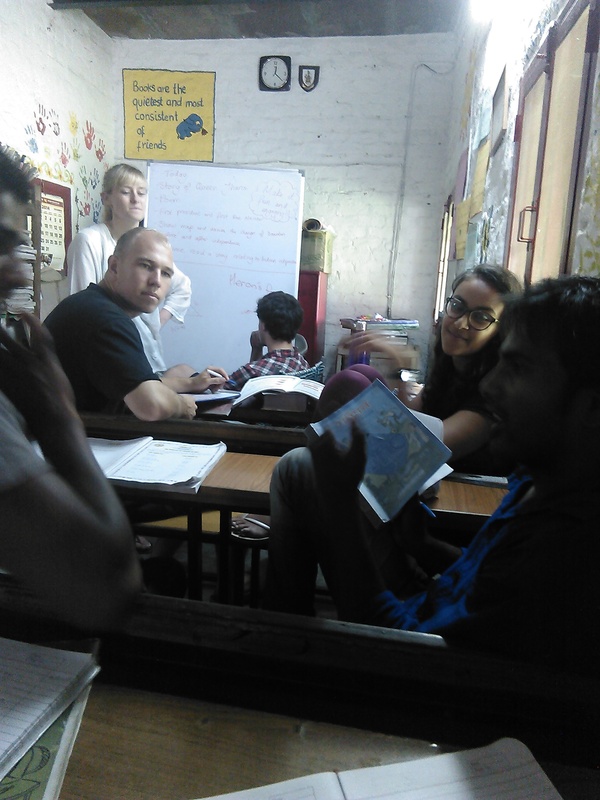 The Warwick Volunteers introduced a reading and listening activity. 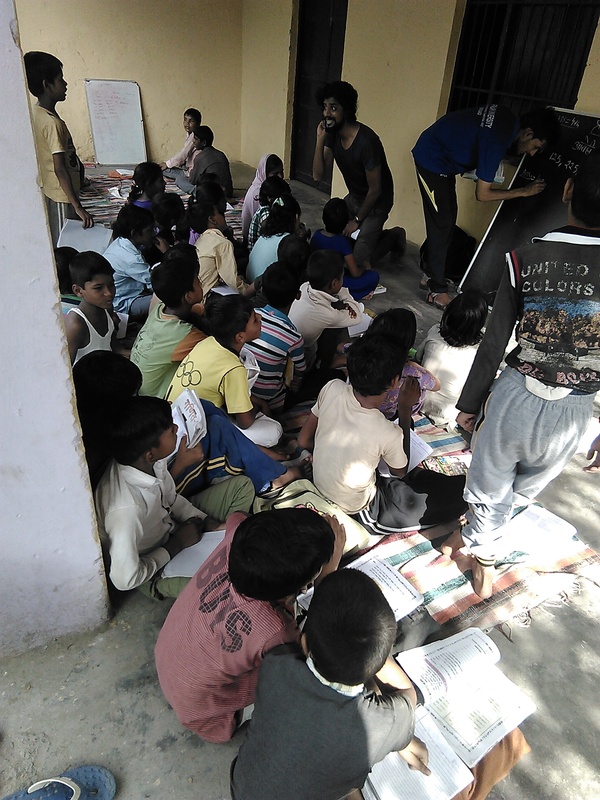 They wanted to engage all the students during reading activities. If the student is reading and you know there are lots of prepositions in your lesson, then ask the rest of the students to clap or click their fingers when they hear any prepositions. This keeps the students focussed. We applied it in our evening centre classes and our students enjoyed it a lot and they were paying attention during the reading and listening activities. 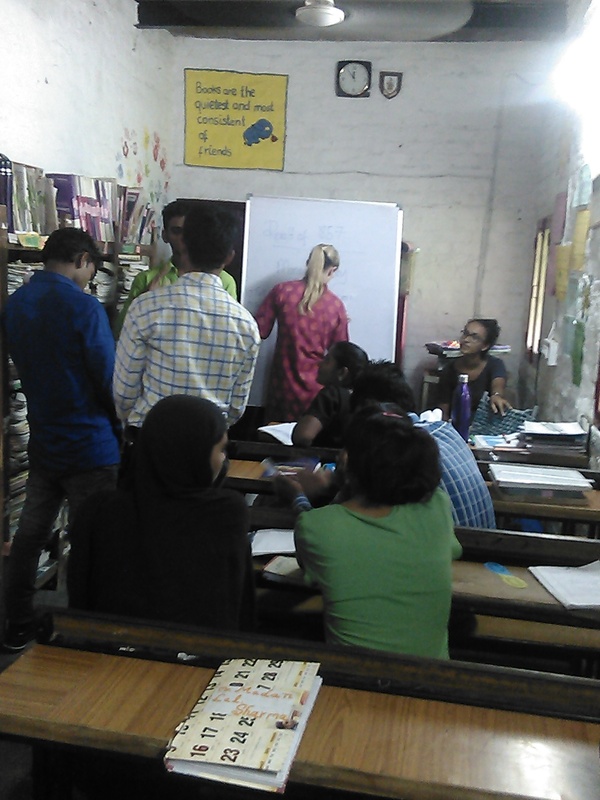 The volunteers divided the teachers into pairs and used a story book for running dictation. The teachers were asked in their pairs to go and take a look at the story book for thirty seconds and come back and write in their note book as much as they could remember. The second person did the same. 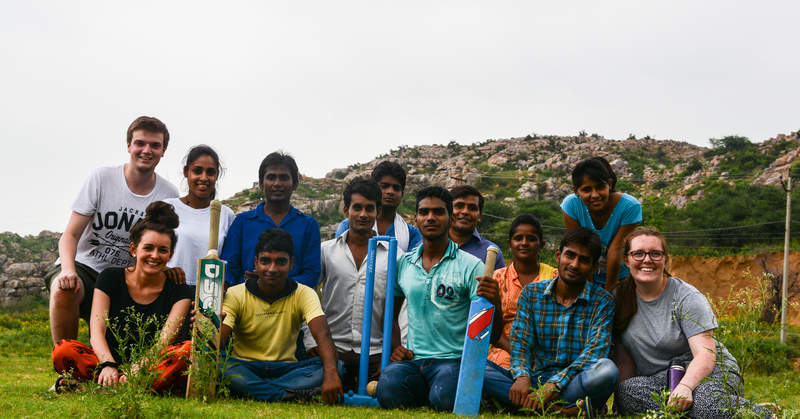 It was a very innovative idea to build the work capacity and team work as well. Teachers enjoyed it and they were helping their partners. After that we found good team work amongst the teachers. 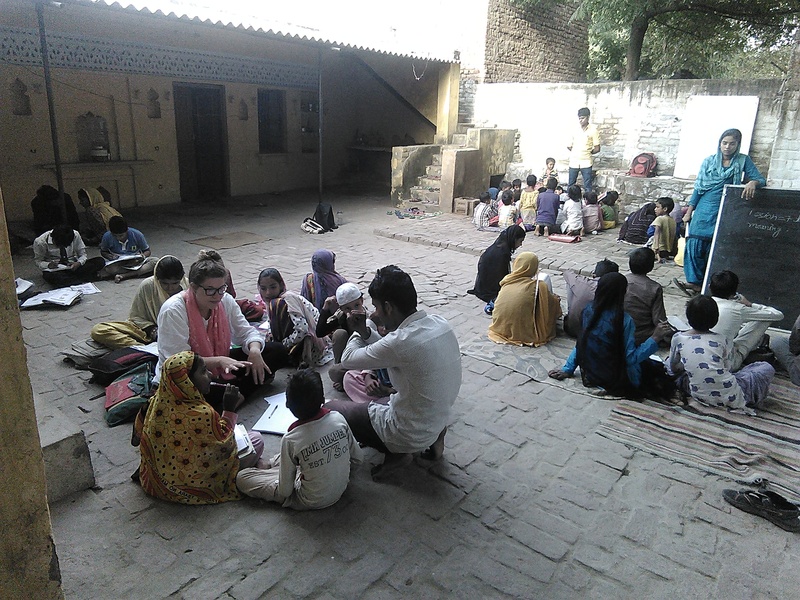 After two weeks the volunteers ealised that they wanted to do something on time management and planned a workshop to teach the teachers time management. 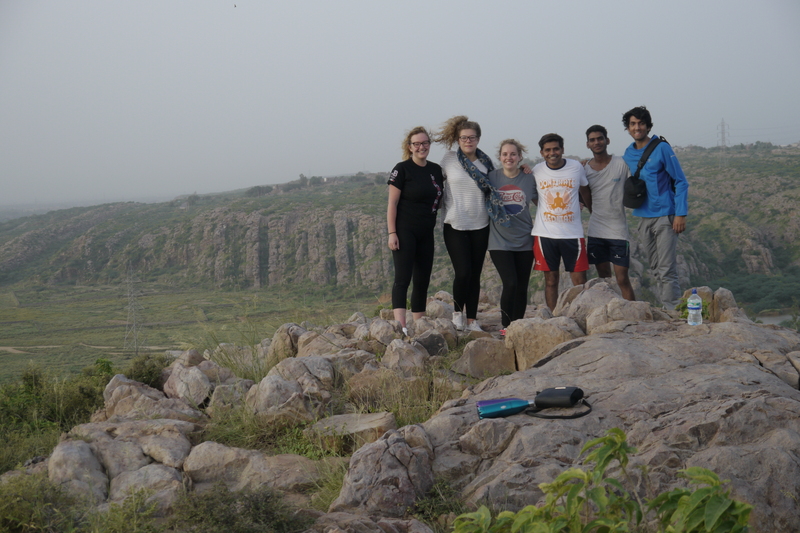 The Warwick Volunteers decided on three different tasks: easy, medium and hard and gave the same timing for each. 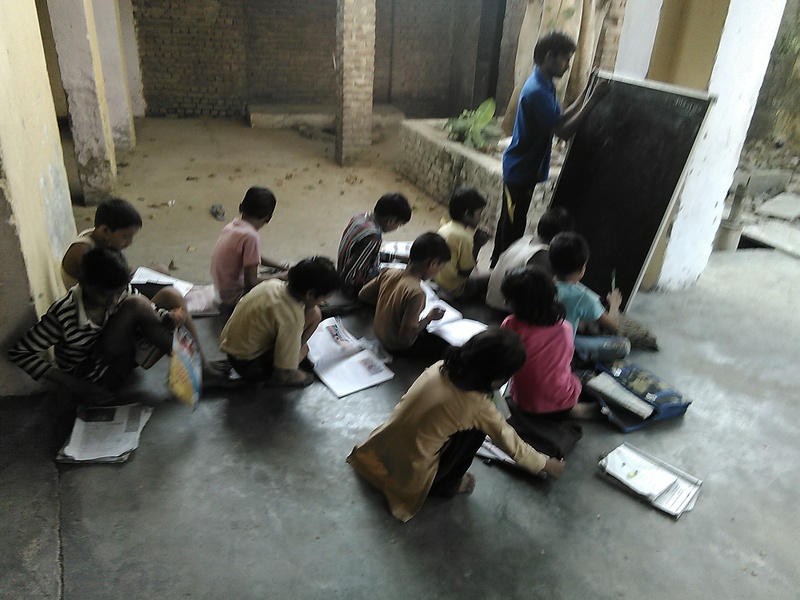 In the first five minutes they asked the teachers to write the alphabet in their notebook, during the second five minutes they asked them to write two words for each letter of the alphabet. In the last five minutes they asked them to write a story about five things such as: a globe, a water bottle,a scarf, a clock and a monkey and it must be four pages long. Then they asked the teachers about each task and the teachers found the last activity the hardest, they could not write one page. 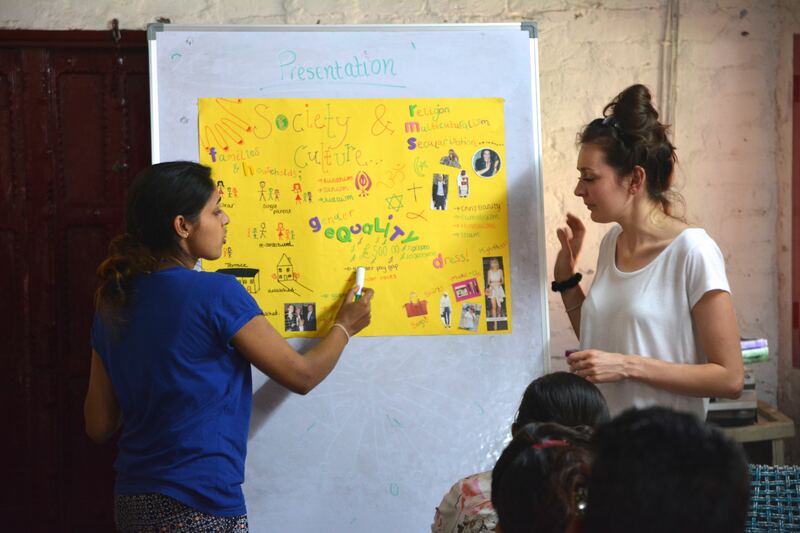 The volunteers explained the objective of all three tasks and made them think about time management. 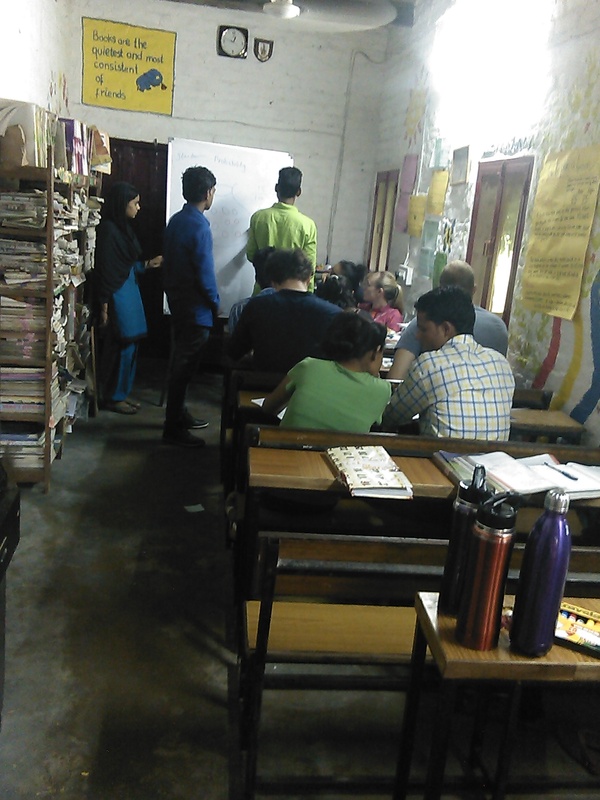 We discussed as a group and made sure to plan the lessons according to the capability and level of the students, as well as using their time effectively. After that they taught a maths lesson about mean ,mode and median by using different examples which relate to our daily routine and daily life. 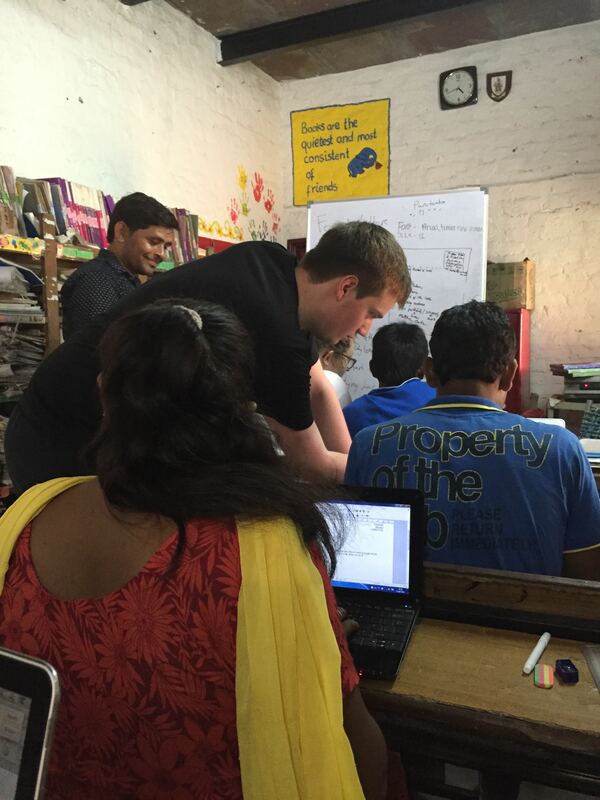 The volunteers tested the teachers about their computer skills. They assigned some tasks about Microsoft word and power point presentation, which increased in difficulty. Next class will be to create their e mail addresses and how to use them. 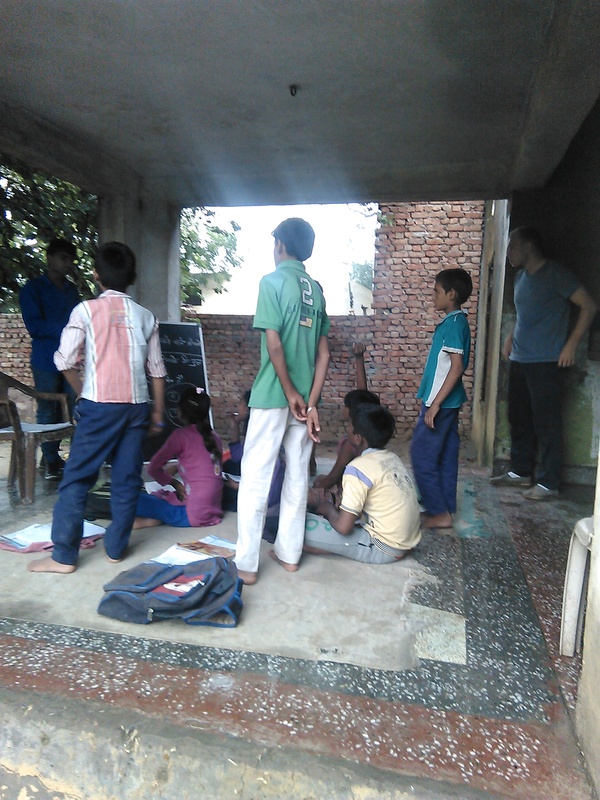 On 10th August, 2015 the Warwick volunteers started the morning class teaching Probability. 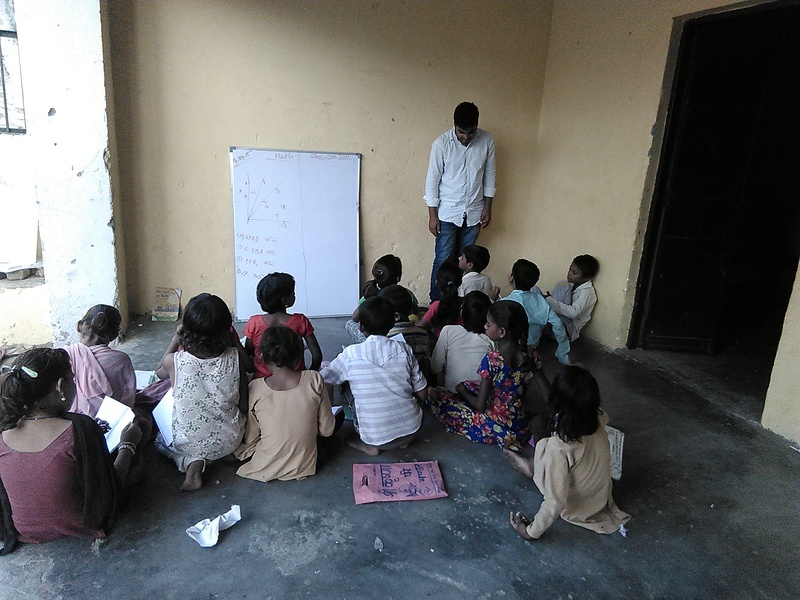 We asked them to teach probability to the Laksh teachers because they often find it difficult when they teach it to the kids. Therefore they planned the morning lesson on this topic and explained probability very well. One way that they explained probability was by using lots of simple examples such as, the day after Tuesday will be Wednesday, etc. Then they explained how likely something is to happen with words like impossible, certain and even odds. They also explained different types of probability such as Theoretical probability and Experimental probability. We played a probability game with the teachers and students as well. In the game we pointed to the corners of room and named them likely, unlikely, impossible, certainly and even odds, and then we asked lots question and got the teachers to think about the probability of the question and then go into the correct corner. They enjoyed it lots and they also asked questions regarding probability to each other. 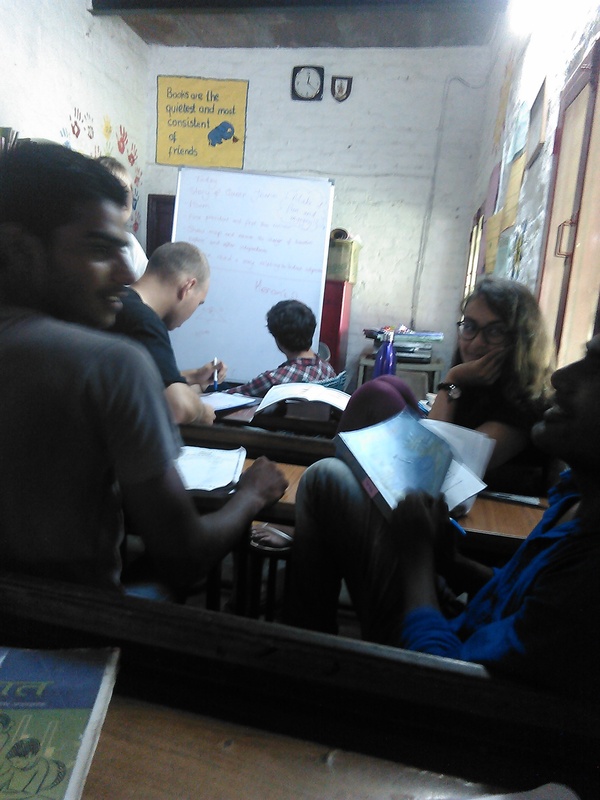 English lesson started with reading and how to make reading fun. They demonstrated first how to make the reading fun and then asked to the teachers to do the same. This was done by them asking the teachers to focus on their expressions, voice, instructions, acting and body language. 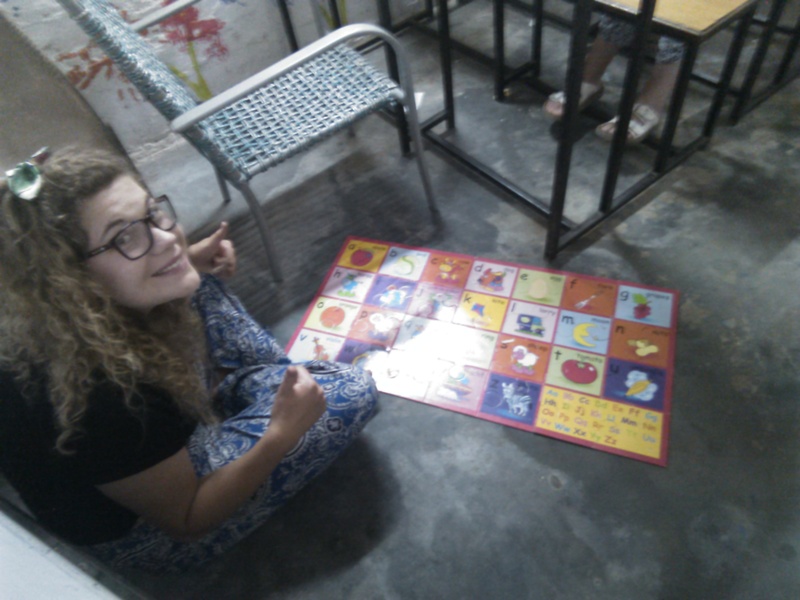 We then played two games during the English lesson. In the first game, one instructor gave instructions to all of us such as, Make the statue of a soldier, etc. In the second game we divided ourselves into two teams and one instructor asked both the teams to make the structure of an object by using their bodies. We really enjoyed it and it was a new memorable technique to make children learn object names in English and Hindi. They are doing this learning by making the structure of object with their bodies. 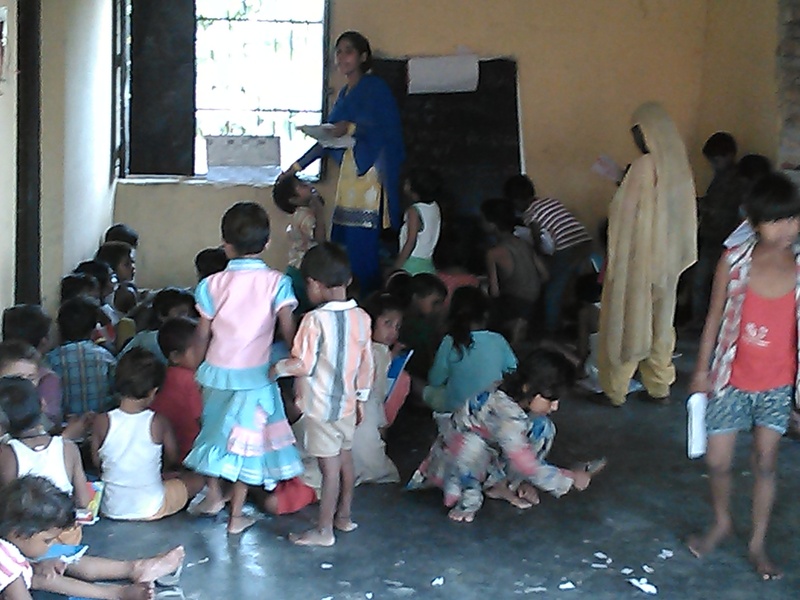 Everybody was engaged in the activity and had lots of fun as well as learnt. As I mentioned in my previous blog about the 2nd batch, we have four volunteers and they have specializations in different subjects. 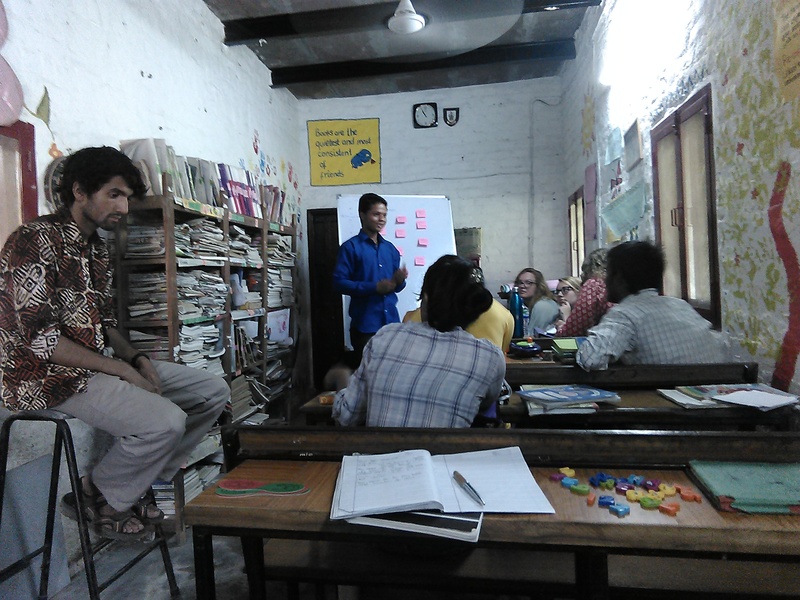 We decided to divide the morning teachers training class into two sessions. One session for Mathematics and the second session for English. 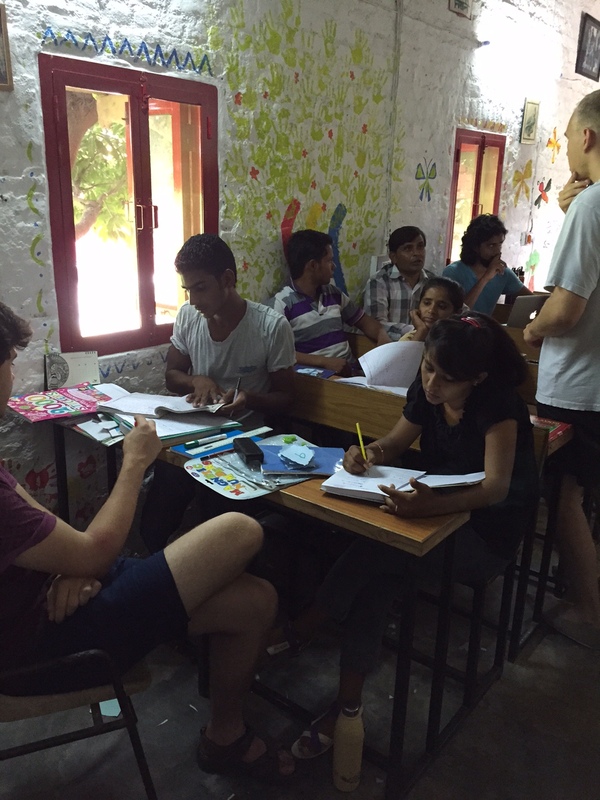 Shirin and Jade teach English ; Adam and Giles teach Maths. 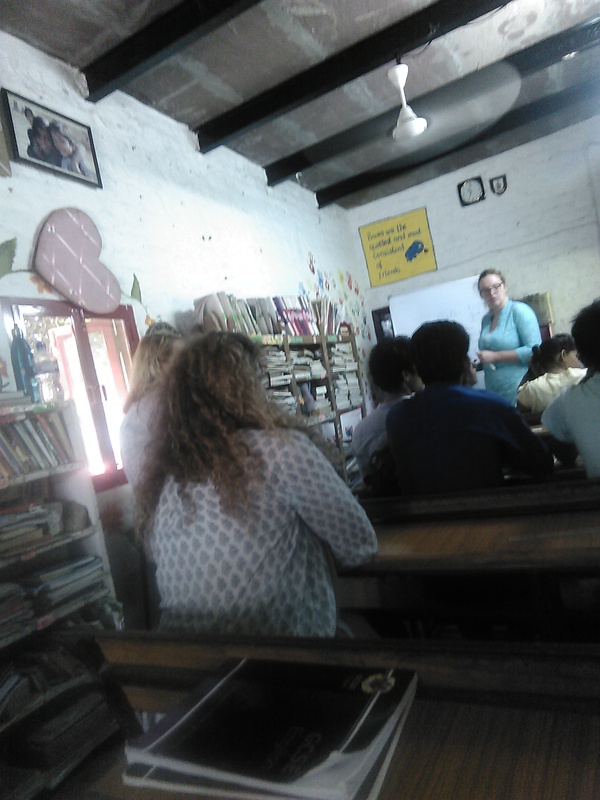 On Tuesday morning they started the morning class with their introduction and they asked some questions to the Laksh teachers such as, what do they find difficult to teach the students of Mathematics and English. 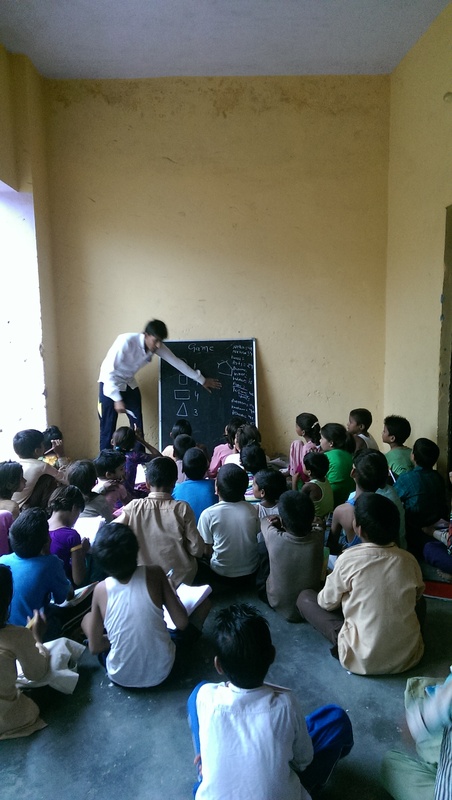 They started maths class first and taught additions. They taught how to arrange the numbers using the place value such as, unit digit, tens, hundreds and thousands. They used different shapes to teach the place value such as, circle for unit, triangle for tens, rectangle for hundreds and pentagon for thousands. Hence, they taught the addition along with shapes. Jade and Shirin started the English with alphabet song by using the letters. They asked the teachers to pick a letter and pronounce it many times and then say a word beginning with the same letter. The whole idea behind the activity was to correct the pronunciation of letters and increasing vocabulary as well. After that they organised the conversation activity among the teachers such as, Doctor and patient , customer and shopkeeper, friends calling and customer to waiter etc. 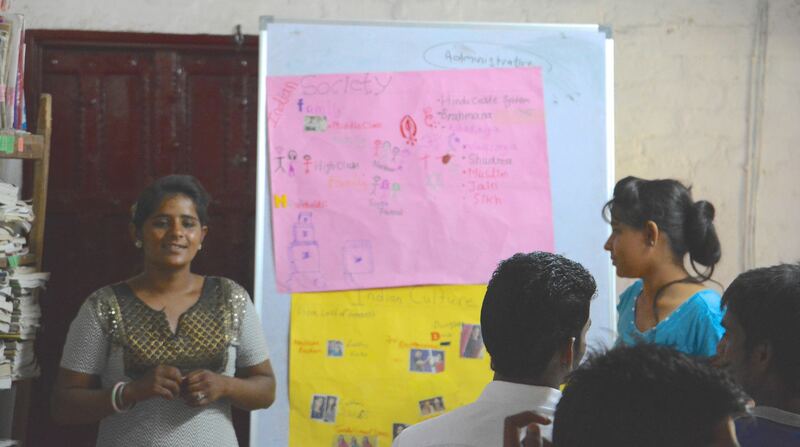 They organised the activity to improve the communication skills and confidence of the teachers. They also organised an activity where the teachers complimented each others teaching qualities. We made a circle and asked one person to turn around and the rest said one good thing about him or her. 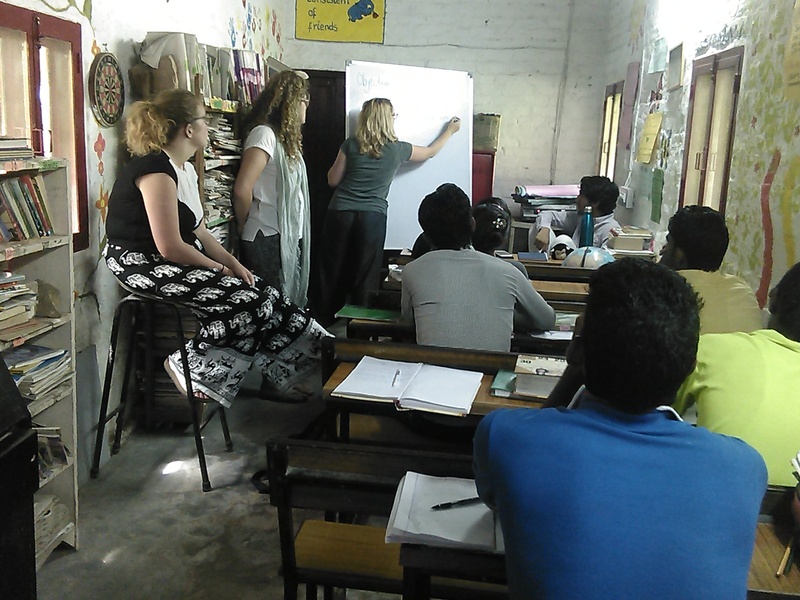 This was the last week of the first batch of Warwick Volunteers and they worked on life skills education in morning classes. They started on Monday with the Curriculum Vitae. They explained the uses of CV’s and how to write them. They taught the basic points that form the foundation of writing a CV. All the teachers wrote their own CV using the computers. 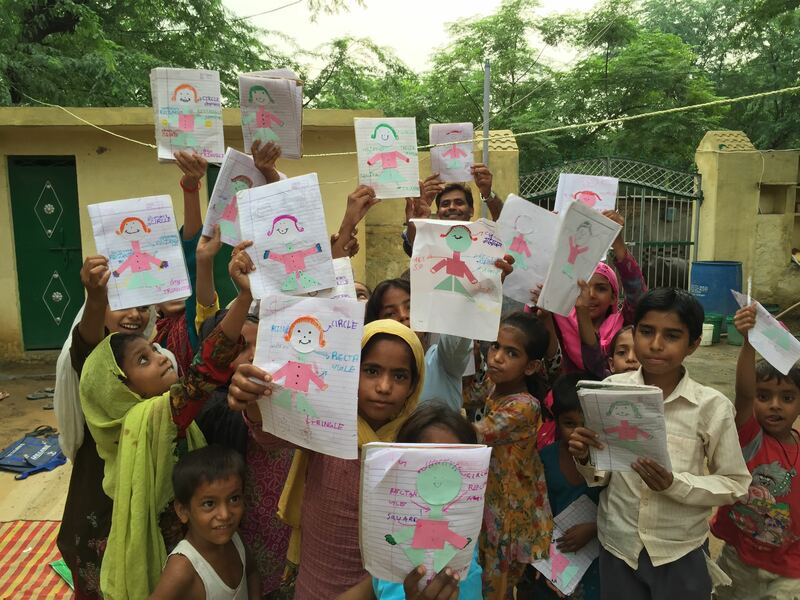 They wrote their personal information along with educational qualifications and work experience as well. The next day they started to write covering letters for jobs. 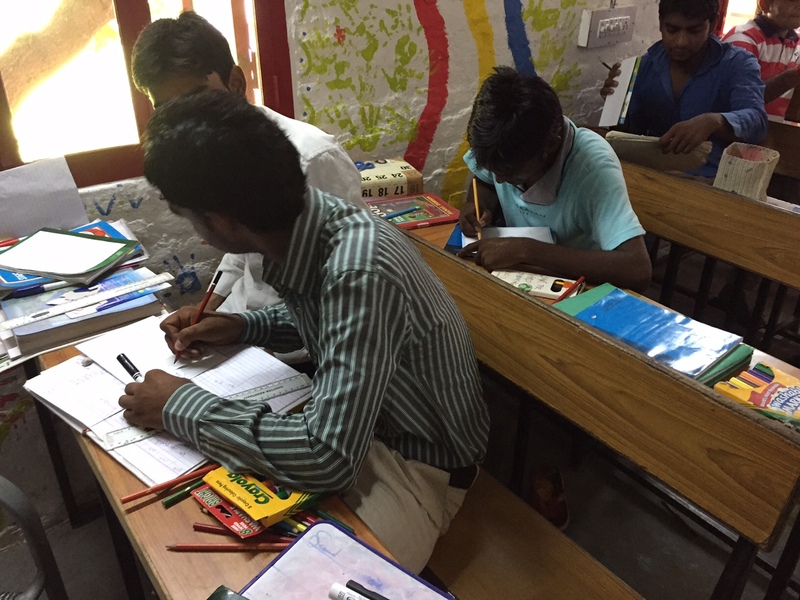 It was hard to learn for them because they are not used to writing covering letters but they seemed very excited to learn it. They worked on interview skills as well. They asked their interest of working and taught them how to be prepared for interviews. It was really interesting to know their job choices after they will finish their study. The whole idea behind this particular lesson plan was to make the teachers more presentable and confident. I still can not believe the four weeks has gone so quickly. It seems like we met them one week ago. It was really wonderful with the volunteers. 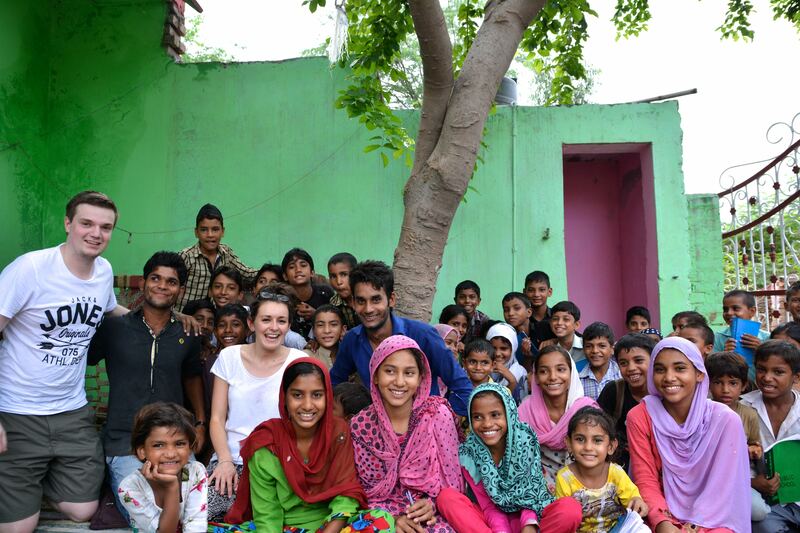 We worked very hard with them and our students learnt lots of things from them. Today, they started the morning class with Origami and taught some different things such as: how to make a crown, swan and boat. It was fun day today and everyone had lots of fun. We played volleyball and cricket then had Jalebi and samosas. 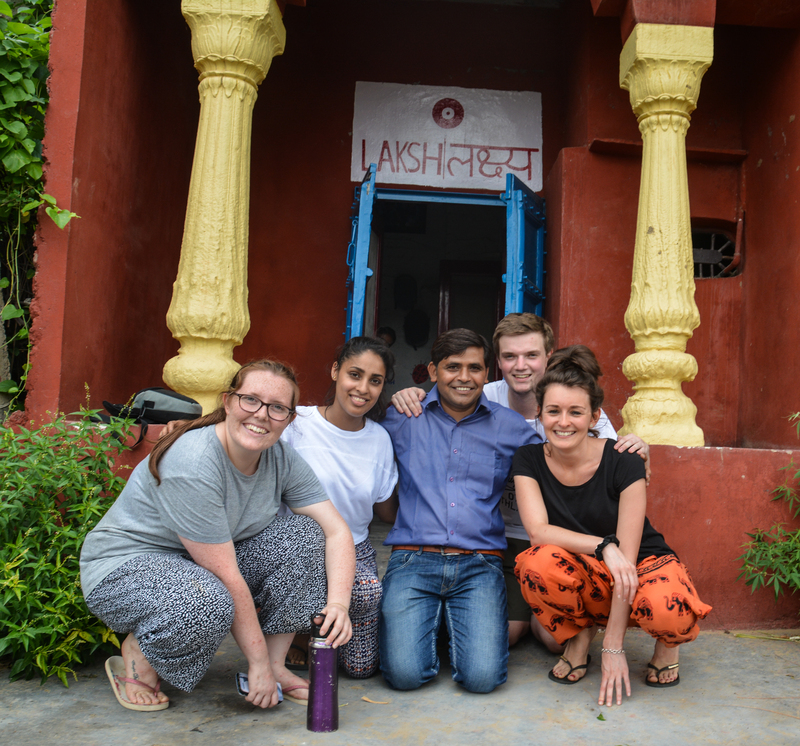 The Warwick Volunteers said a massive thanks to the Laksh teachers. 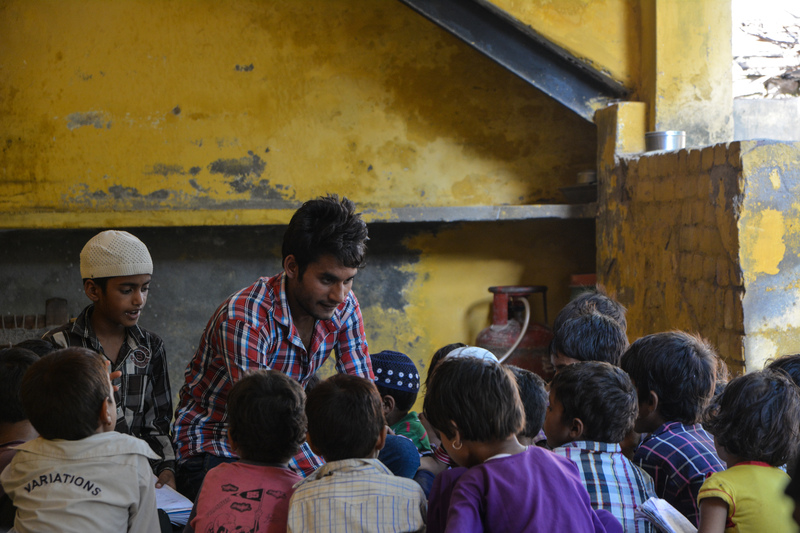 The volunteers visited all centres to say bye to the students as well. 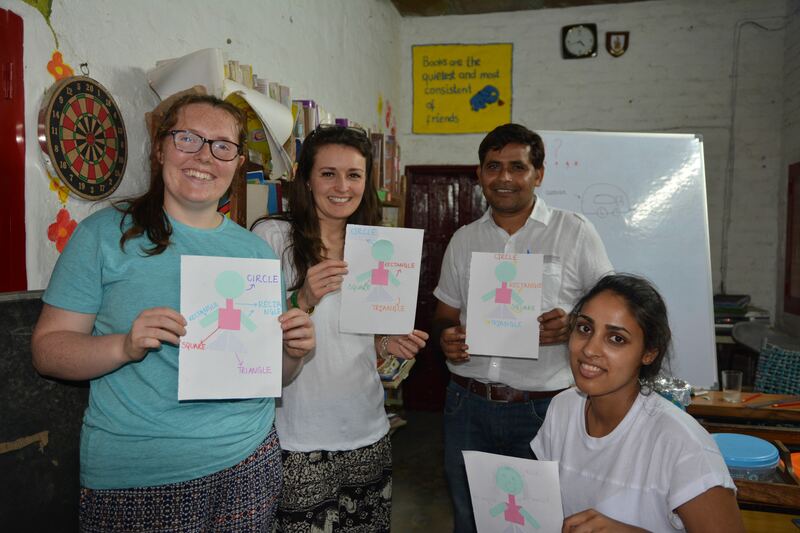 Thank you very much Puja, Fiona, Matt and Carli for being with us for four weeks. You are adorable and made lots of improvement to our project. We will try to carry on forever what you taught us and improved our system. 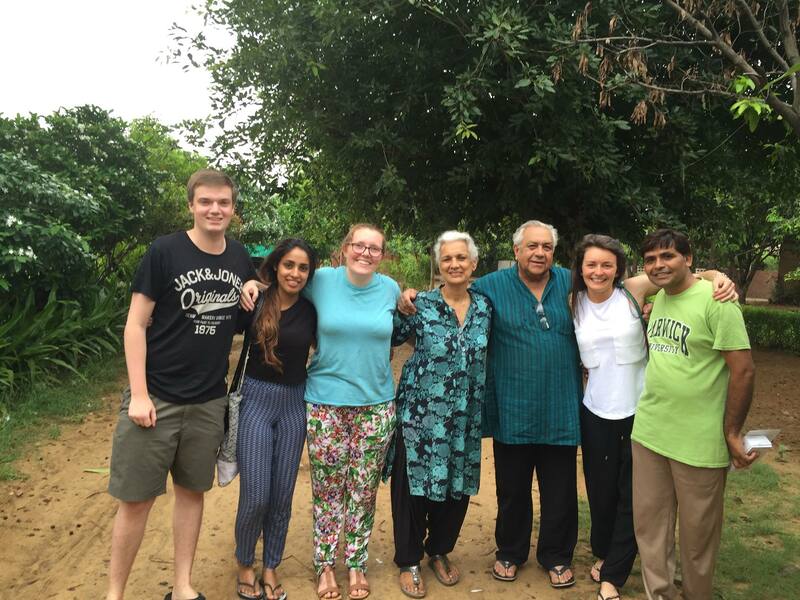 3rd August, 2015, we greeted the second batch of the Warwick volunteers. 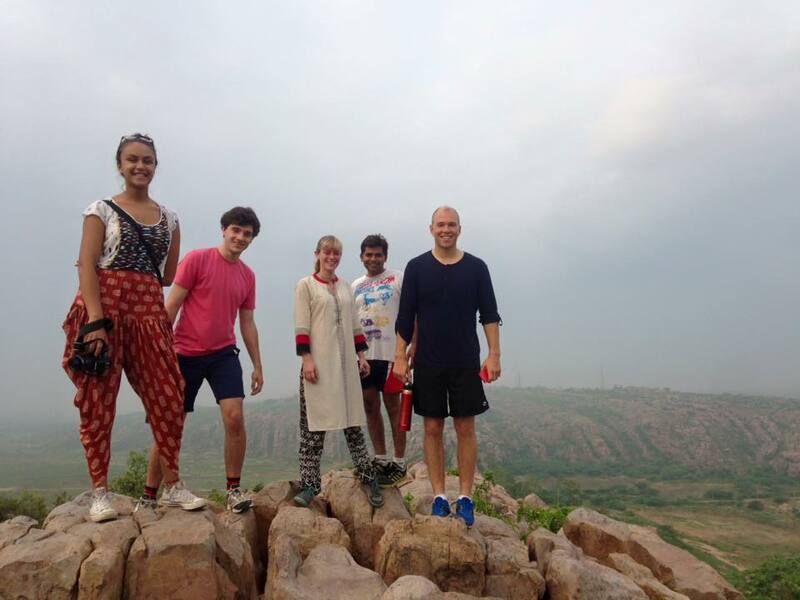 There are four volunteers Mr. Adam Walter, Mr. Giles Carey, Ms. Jade Vidler and Ms. Shirin Shah. 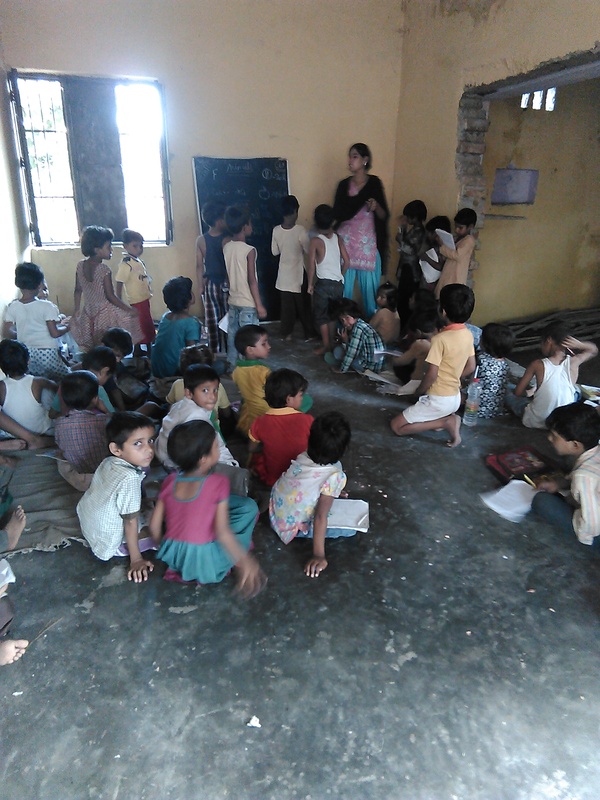 They visited all the centres in evening and they were inspired . We started our morning class with the introduction of volunteers. They introduced their name and education. 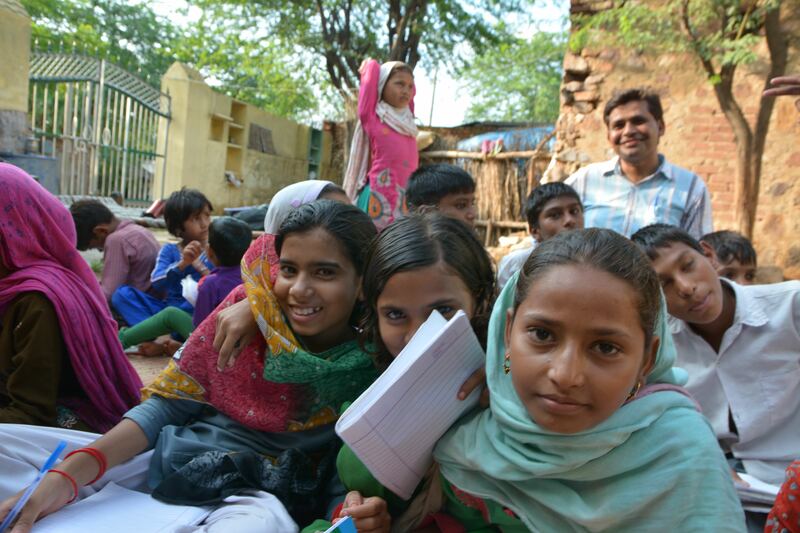 Mr. Adam finished his Economics degree along with Maths post graduation certificate of education, Mr. Giles finished his Mathematics honours, Ms. Jade finished her degree of Childhood, Education and Society and Ms. Shirin Shah finished her degree in Politics and Economics as well. We are very lucky to have them. They settled in very well and seems they are working with the Laksh since a long time. We planned lots of activities to teach the teachers and students as well. 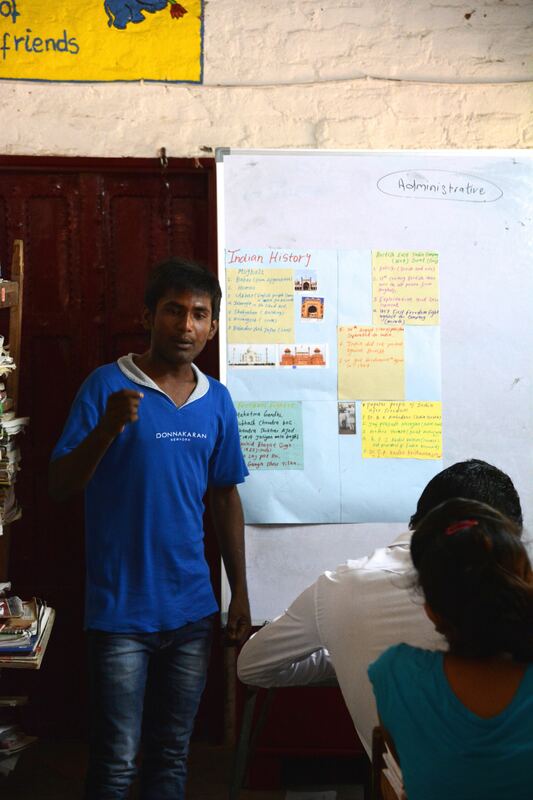 As we have weekly planned for the morning and evening classes; we started this week with presentations. The Warwick volunteers made four presentations on different topics. Ms. Fiona represented the education system of the United Kingdom. She explained very well about the schools functioning and University Education as well. Mr. Matt represented the Political and Economic system, Ms. Puja and Ms. Carli presented the Society and Culture of the United Kingdom. All presentations were very creative and informative as well. They used pictures and explained them very well. We got lots of ideas to assign the presentation for our teachers and students as well. 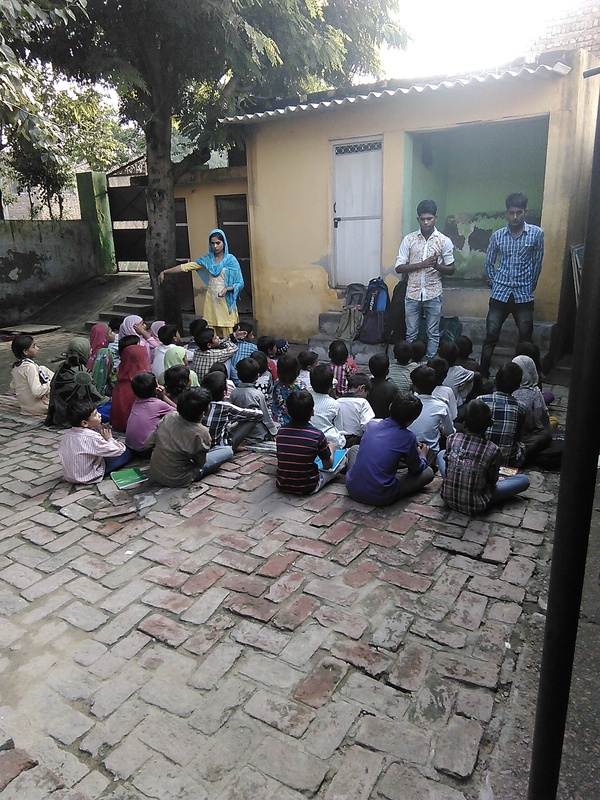 We assigned some topics to the teachers such as; Mr. Ramesh made his on Indian History, Zamaluddin made his on the Indian political system, Washim made it on the Indian Education system, Ms. Ritu on Indian culture and Ms. Sangeeta on Indian society. They all tried very well to make the presentations creative and informative as they learnt from the Warwick volunteers presentations. We found lots of similarities between the United Kingdom and India on each topic. 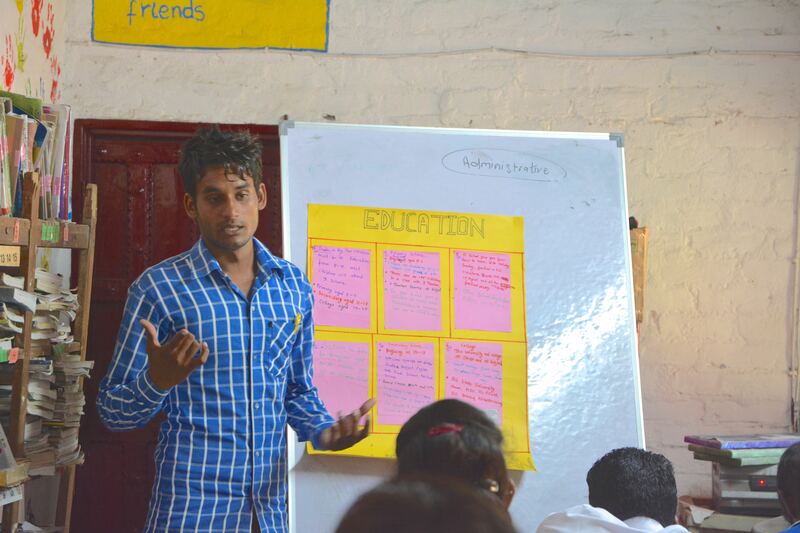 We decided to give some easy topics to our students as well. 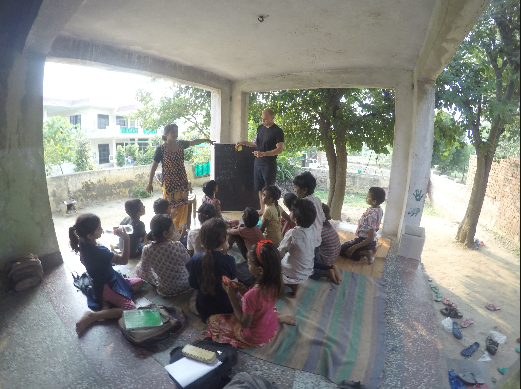 We chose some topics for them such as village life, monsoon crops, village festivals, local governing bodies and explanations of their schools. First, teachers presented their presentation in front of the students and then assigned them the above mentioned topics. 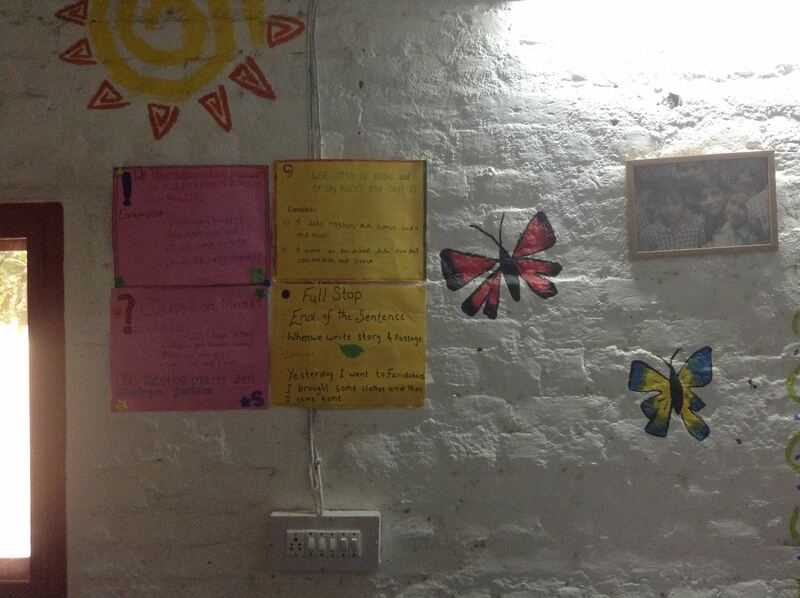 We gave the topics VI to IX class students in groups. We made sure each group had a student from all classes and each group made presentations on their assigned topic. We gave them lots of ideas to collect the information for their presentation topics. We found they tried very hard and were looking very happy with their presentations because they learnt new things. They were very excited for the presentation and explained them very well. 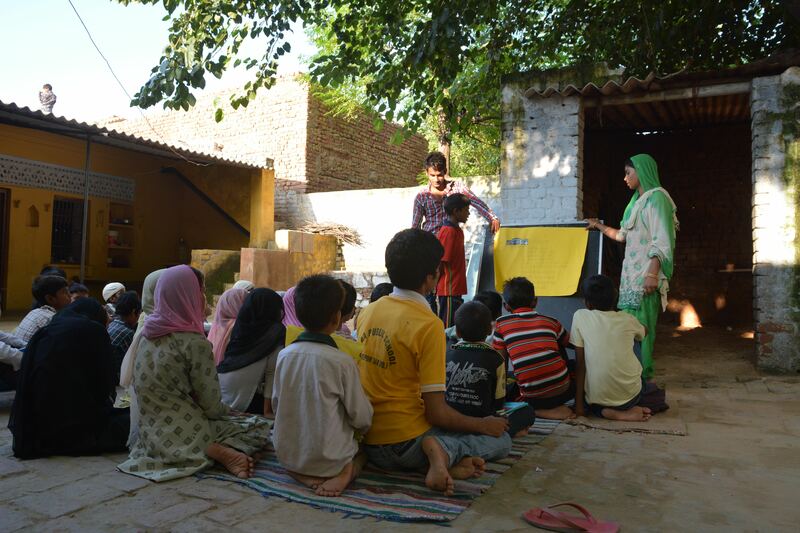 Hence, we are trying to teach some more creative things along with their school curriculum. The second week started with the revision of punctuations and speech marks. We asked the teachers to make some sentences of conversation using the speech marks and punctuations and we found the teachers understood it very well. The next day we started the class by explaining apostrophe’s. 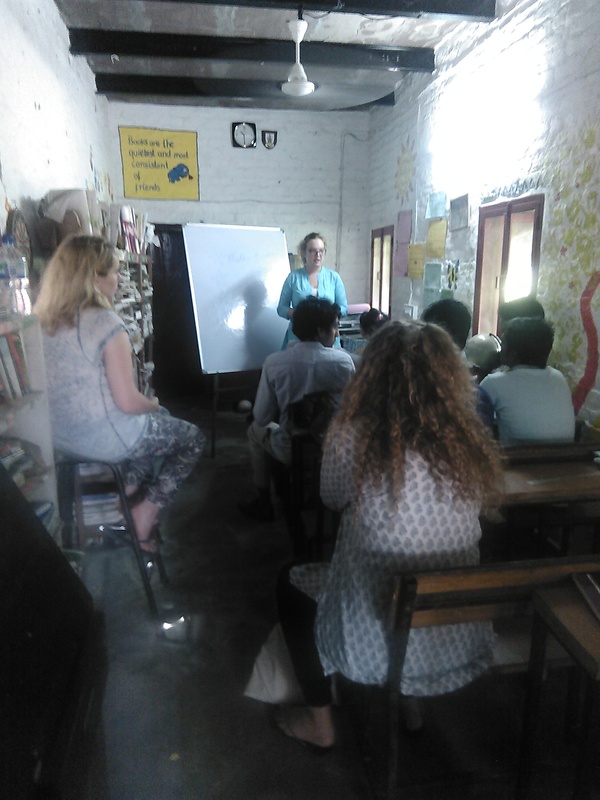 The Warwick volunteers taught the teachers how to use the apostrophe’s to join two words and how the pronunciation of the words changes as we use apostrophe’s. We asked the teachers to write some joining words using the apostrophe’s such as (do not makes don’t etc.) They taught possessive apostrophe’s (shows something belongs to something else) e.g. 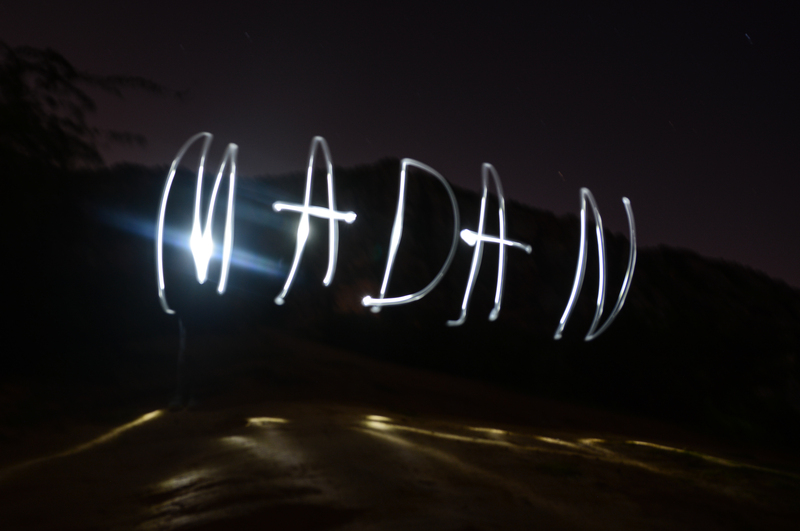 ‘The car belonging to Madan.’ (Madan’s car). 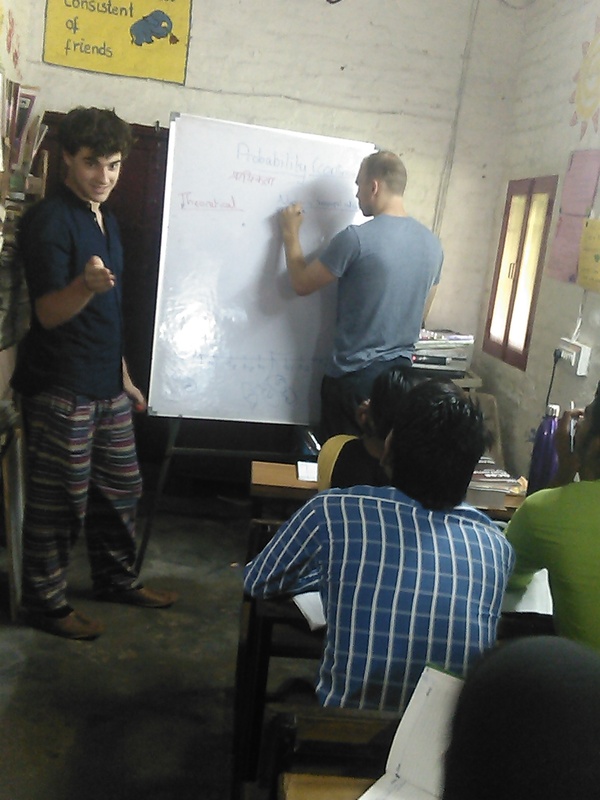 The teachers learnt how to use the apostrophe’s with singular and plural nouns how as well as using irregular plurals. We found out some new ideas for increasing the vocabulary of teachers and students such as the use of the letters from the word PLANETS to make some more new words – we made 70 words! 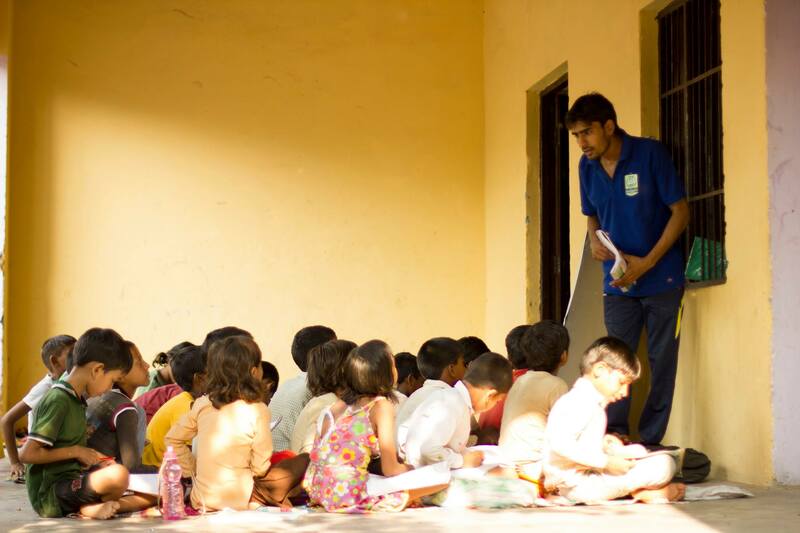 Hence, we are doing this exercise with the teachers and students as well on a daily basis, using different words. 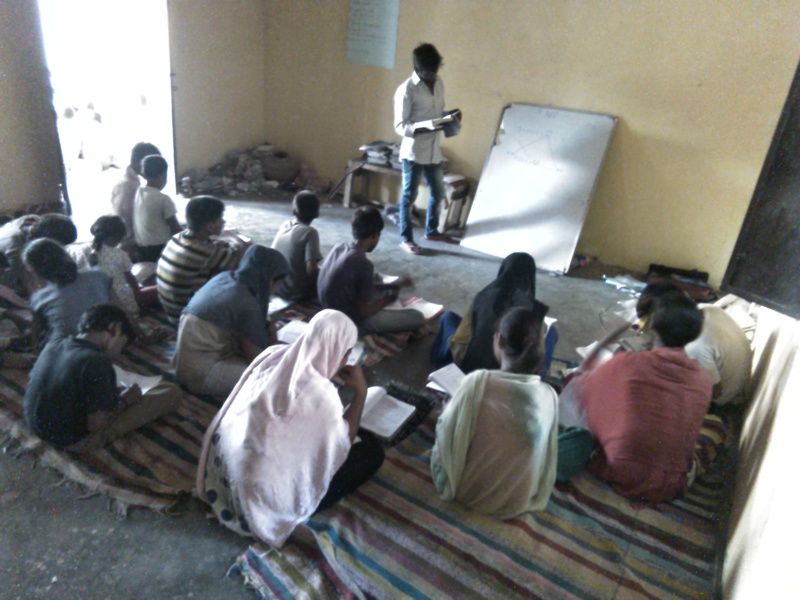 On Wednesday we moved to a brand new centre in Alampur Village. It has more space than the older one and more weather protection. On Friday we decided to do some art activities with the students and taught the teachers how to write formal and informal letters. They learnt the basics of letters and we taught them how to use computers to write their letters. As I explained in my last blog about the morning classes planning; we started our morning teachers training with a brief introduction. 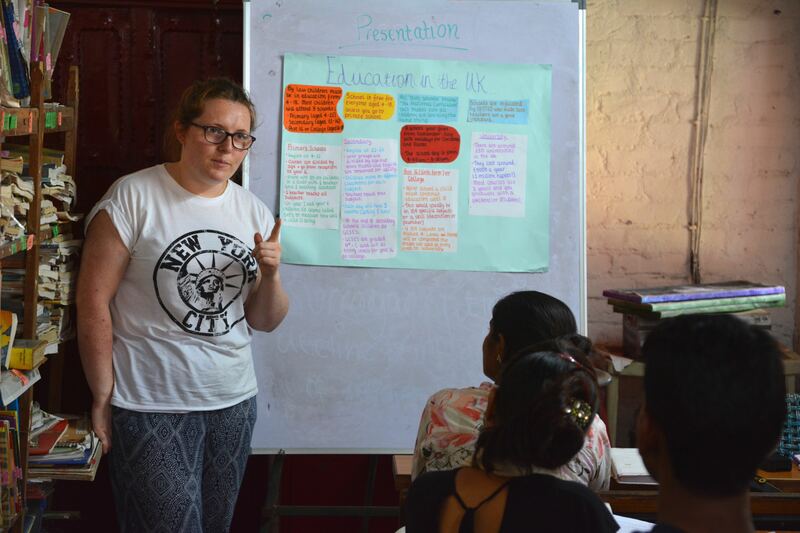 It was really wonderful to know about the studies of the volunteers: Carli is doing PhD in Sociology, Puja is studying Sociology as well, Fiona is studying Childhood Education and Society and Matt is studying Economics. 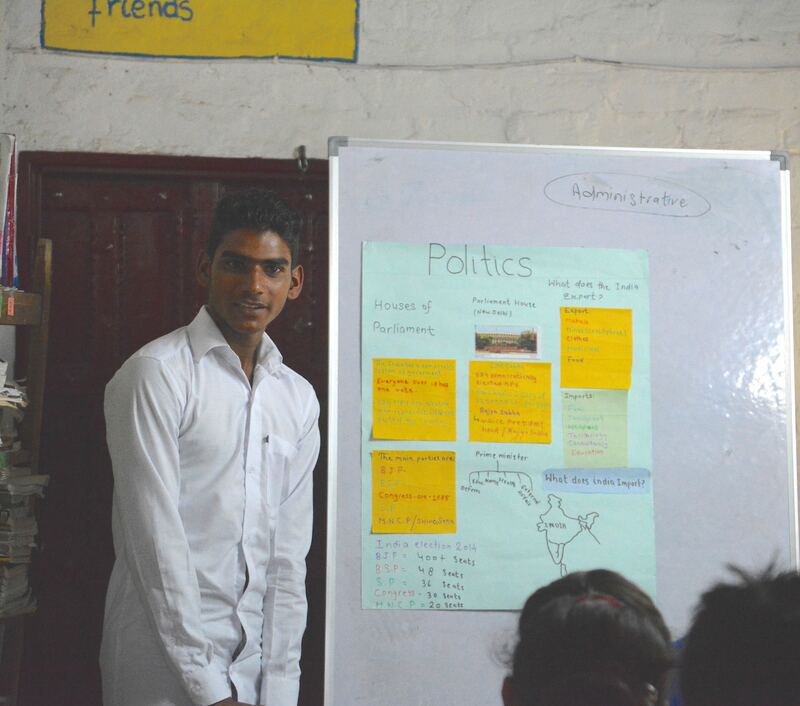 The Laksh teachers introduced themselves along with their study. I was really happy to know that the Laksh teachers were answering well and they know a lot about punctuation, except a few. They wrote some paragraphs without using punctuation and asked the teachers to rewrite the paragraph using appropriate punctuation. 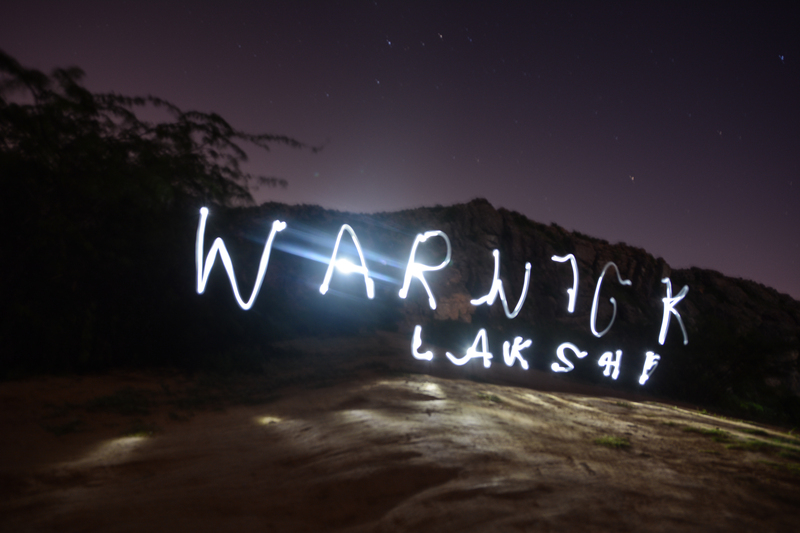 The Laksh teachers did well and we practised a lot using different ways. We asked the teachers to write a paragraph about themselves and write their daily routine using all the punctuation. They taught speech marks as well in the same week. 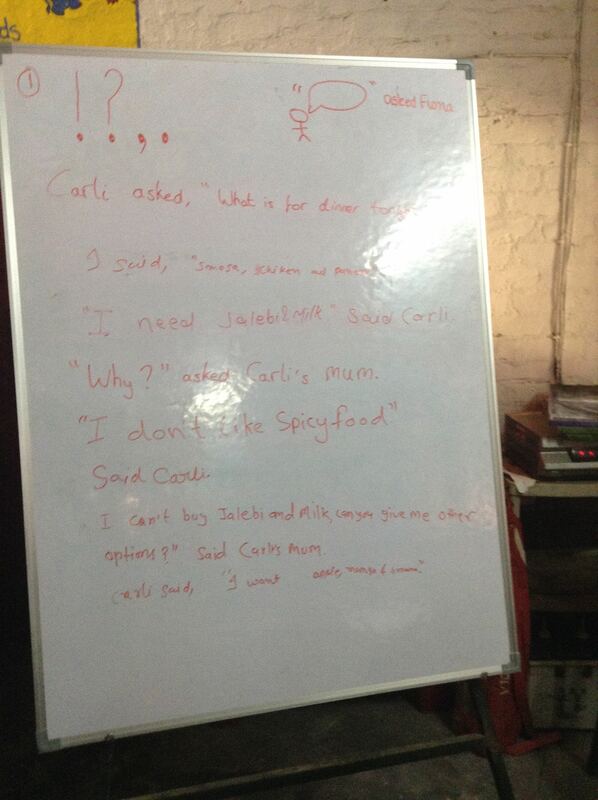 The teachers are finding it hard to use the speech marks, so we decided to practice a lot by using the speech marks. We planned an art activity for Friday fun day, so we cut some shapes like circles, triangles, squares and rectangles and made a human body using these shapes. It was quite funny to do that! Basically, the whole idea behind the art activity was that we wanted to introduce about the shapes and their sides but the circle doesn’t have sides. Unfortunately, we couldn’t do that with the evening classes due to the rain, but we will definitely do it next Friday along with the next planning which we have already planned for everyday. We discussed about evening classes and decided to start the classes with vocabulary. 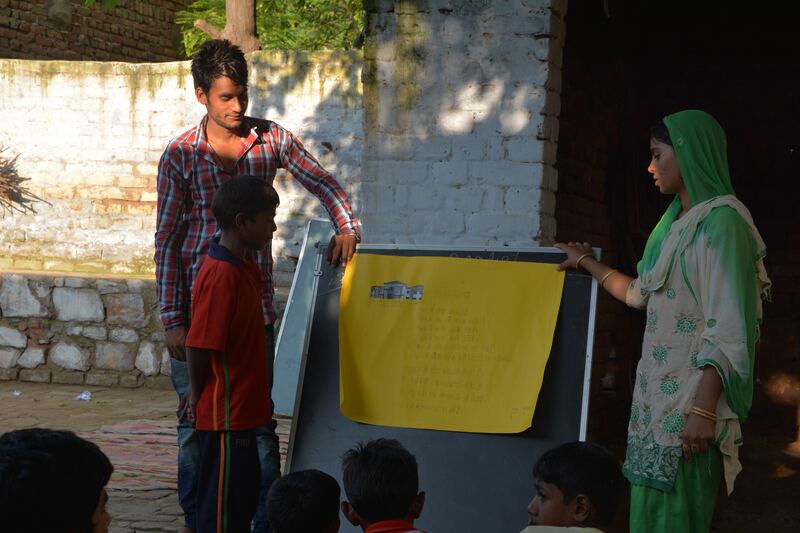 We made four boxes and asked the students to write the difficult words on flash cards with their Hindi meaning and put them into the box which we already made for each centre. We are collecting the new words everyday and we will play word games with the students any time and we are trying to increase their vocabulary. 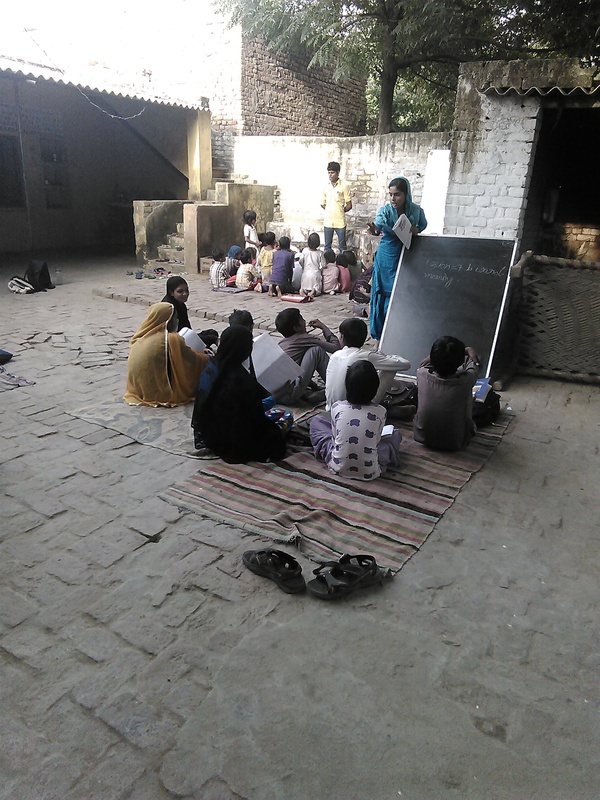 The Laksh teachers make the lesson planning for evening classes as they have allotted the classes. They taught the school curriculum along with the word meaning. 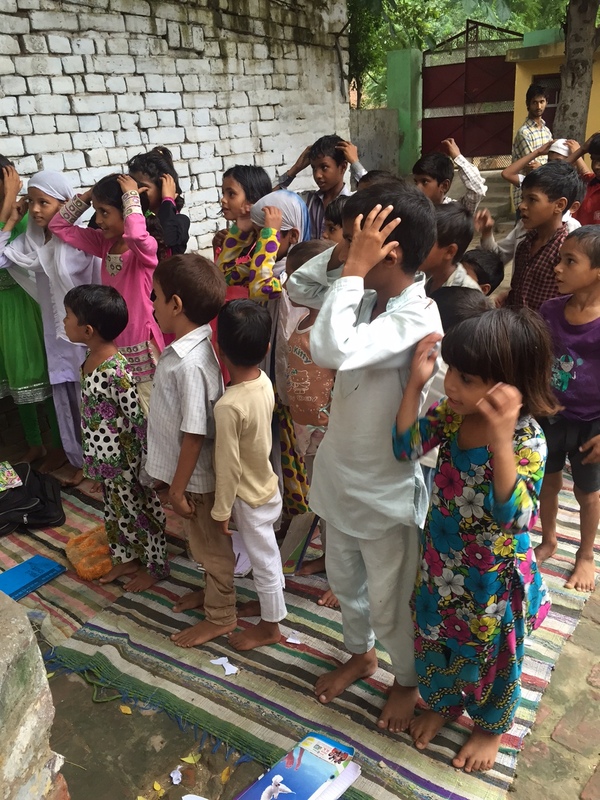 We have decided to teach them some general knowledge alongside their curriculum. 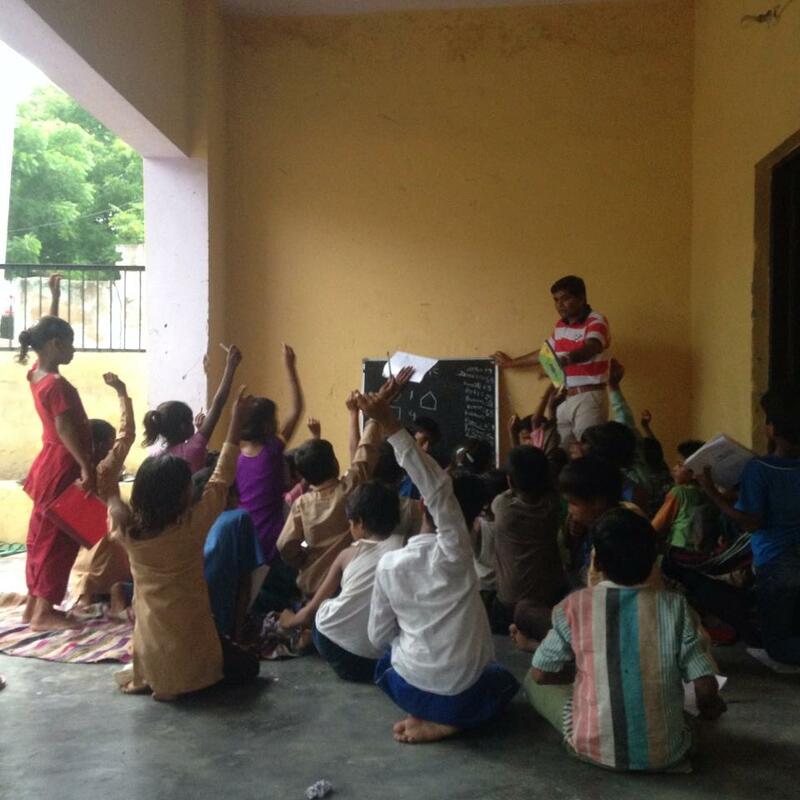 After the two hour classes we teach them about the Monsoon season and trees of our surrounding. 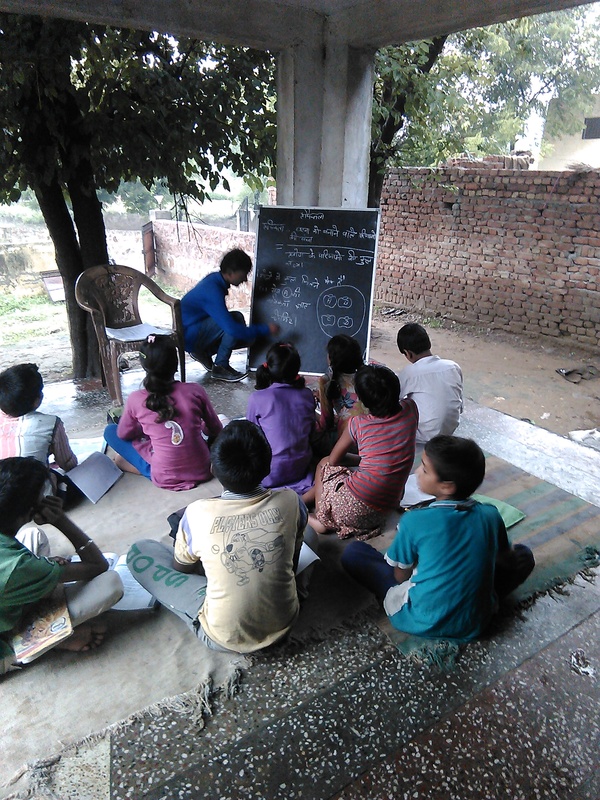 We are trying to increase their knowledge using the different techniques.